A slight breeze rustled through the mangled blades of grass as the sun beat down. A low howl was heard from across the property. Not a bark. A howl. Two full grown wolves trotted from behind a plastic shelter and made their way to the gate to greet that day’s visitors. Icy, blue eyes tracked every move made as people walked along the worn down path. The Wolf Hybrid Adoption and Rescue (WHAR) in Paso Robles is more than a home for several wolves. It is a sanctuary — a facility where animals are brought to receive the care, training and rehabilitation needed to get them back on their feet and adopted. Established in 1999 by CEO Kristi Krutsinger and her husband, WHAR has been the home to more than 150 hybrid and full-blood wolves. The endeavor began when their family dog was killed along a highway after escaping its pen. After some time, the couple responded to an ad for a Malamute mix in hopes of adding to their family again. However, the family soon found out their new pet was a wolf-hybrid. A neighbor, who also had a hybrid, offered to help build them an enclosure in return for watching his animal while he vacationed for several months. The Krutsingers agreed. Once their neighbor returned from his trip and retrieved his hybrid, they were left with a large, empty pen. They soon started rescuing hybrids and built three more structures. Four years and 20 animals later, they started the application process to become a nonprofit due to high expenses. People began to stop by and take notice of these animals, which sparked curiosity within the community. Donations from family, friends and community members helped them build the rescue and allowed them to maintain upkeep. This exposure and attention also led to an increase in rescued animals. Many times, these animals are brought in after experiencing neglect, harsh and improper living conditions, illegal breeding or being left in the wild and expected to survive on their own, according to Krutsinger. 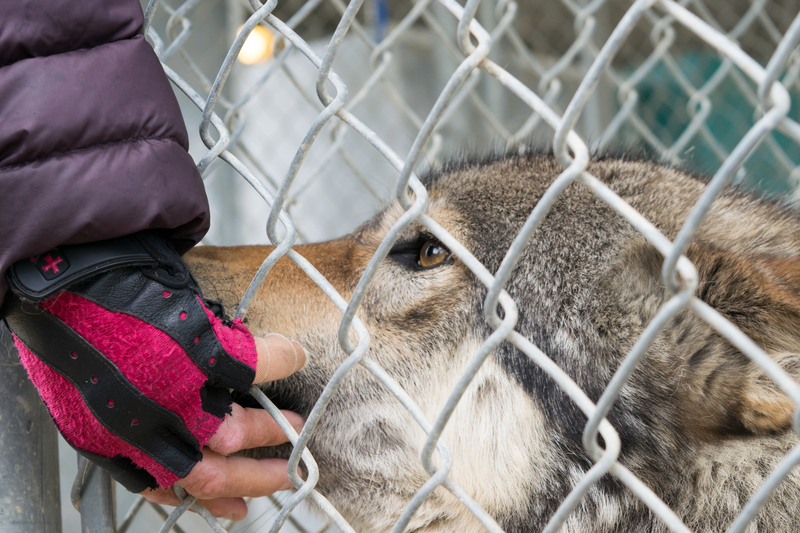 Josie McGhee, a volunteer animal handler at the rescue center, is responsible for basic upkeep with each of the wolves, including replacing their food and water, exercising them and assessing their physical care. “People try to treat [wolves] as dogs when they’re so much more. You can treat a dog like a wolf, but you can’t treat a wolf like a dog,” McGhee said. Krutsinger stood about 5-feet-tall, wrapped in several layers of wool and down feathers that shielded her from the wind. Her fingers gently ran along the outside of the fence, receiving excited licks and playful howls. She spoke to each animal as if they were longtime friends. Having ––been at the shelter for almost 20 years, she had familiarized herself with the wolves. “All these animals have a wonderful heart. Wolves are amazing, civil and thoughtful creatures,” Krutsinger said. Inside the chain-link fences of this sanctuary, both hybrid and full-blood wolves can be found. Full wolf species at the rescue include red and gray wolves, which include Arctic, Great Plains, Mexican and Timberwolves. Hybrid-wolf mixes look very similar to a full-blood wolf with thick coats, over-sized paws and colorful, piercing eyes. However, there are key differences between the two, both physically and behaviorally, according to Krutsinger. Dogs are less combative and have more barrel and rounded features, whereas wolves tend to have more triangular characteristics. Wolves are more athletic than dogs — running, jumping and climbing over the wooden crates inside. Unlike a normal canine, these animals have no webbing between their toes, which enables the wolves to use them as we would use our fingers. Chiefy, a four-year-old full-blood Timberwolf at WHAR, demonstrated this. As Krutsinger approached the enclosure with a raw chicken drumstick in hand, Chiefy paced back and forth, jumping about four feet in the air. Right before the chicken leg poked through the square hole of the fence, Chiefy leaped up, wrapped all toes around the chain link fence and held on while chomping down on the snack. As a non-profit organization, WHAR makes public education a priority by ensuring individuals are aware of the differences between dogs and animals who are part wolf. Some of the wolves are taken to different schools, libraries and events to inform children, students and the general public about these exotic animals and the potential conflicts that may occur without proper treatment and care. Animal science associate professor Marc Horney studies rangeland resource management and has been involved in many discussions and debates regarding wolf management, especially in the state of California. He has observed an increased level of concern regarding the protection of the wolf hybrid population due to them periodically escaping their enclosures and the lack of training owners receive on what exactly their behavior can be like. After several months of learning hand signals and commands, respecting boundaries and orders and understanding each animal’s personality, staff members put them up for adoption in hopes of finding them a forever home. All of these animals can be seen, fed and learned about on one of their daily tours.